New students often tell me that they don’t know what to do next while fencing, so I’ve been thinking about how to explain this for a while. This past weekend I was at a broadsword seminar run by Broadsword Academy Manitoba where guest Kevin Cote gave a talk about the exceptionally confusing tactical wheel of fencing and simplified it into something similar to this less confusing tactical fencing wheel (this is not the same, though it is similar in many ways) of fencing and how it applies to historical fencing weapons. This got me thinking about doing something similar with my understanding of fencing. I should point out that this deals with the goals of a fencer, and how those goals manifest. We should view the technique that they have chosen as the manifestation of their goal within the specific scenario occurring in the fight at that exact moment. 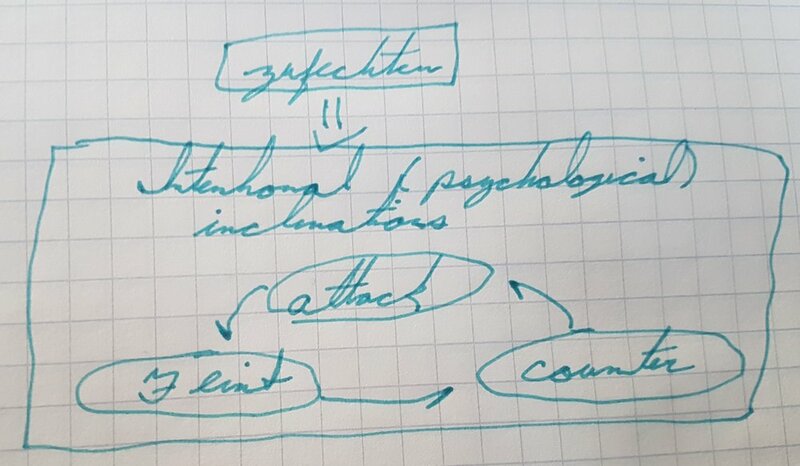 The idea is that you start in the Zufechten (prefencing) before any action is taken by either person, then one person chooses an action, an attack for example, and the opposing fencer must choose an action that beats their action. Actions that control the center are normally done by getting the strong of you blade between the opponent’s blade and their target. The goal is to prevent them from hitting you by using a barrier, either you blade or a shield, or some other object to stop their cut as it comes on line. Again these are conceptual categories not specific to any weapon, so you should just fill this in with whatever options are available with the weapon you are using. This is really any action where you force the opponent’s blade to the side, usually with the intention to side usually with the intention of following up with an attack. However it also includes lateral movement where you move the line such that the opponent’s blade is no longer aimed at you. These categories form a kind of rock paper scissors that should help you understand the category of attack to use in a situation, and figure out which situation your opponent is putting you in. I should point out that it is not helpful to try and memorize lists of technique names and compare them to a list of other techniques. This is about understanding what the opponent’s goal is in terms of how they will handle the fight, and some actions (eg the winden) can actually be used in multiple of these situations depending on what they accomplish. You begin in Zufechten, the opponent cuts to your upper right opening (free attack), you counter with an Absetzen to the upper right hengen (controlling the centerline), the opponent displaces your blade to the left (displacing off centerline) and closes in with a cut to your upper right opening (attacking freely). At this point the best option is to once again control the center, this time with a Zwerchau to the left upper Hengen to hit them in the head on their left. The last bit happens regularly, but often people choose to counter the displacement into cut with a displacement of their own, causing a parry-cut game. Doing the Zwerchau style Abschneiden actually beats their movement more conclusively by keeping your blade on the same side and smothering their action before it has it’s intended result. Alternatively if they managed to cut around and get to the other side of your blade you would still use the same concept but it would manifest differently, this time cutting down onto their blade so it forces it down and onto your strong as you cut down and if you haven’t hit them thrust (a Mutieren). Your opponent is in a guard (controlling the center), you thrust directly at their head (Freely attacking) that slides off to the side and your opponent thrusts you on recovery (constrained attack from a controlled center). Since they have the center controlled from the beginning with their guard, they don’t have to do anything other than attack you since they already have your blade under their control. Even though you aren’t changing sides, this would still be a free attack, you have just been deceived into thinking there is an opening when there wasn’t one, as they have controlled the center from the beginning, and the first attack from the Zufechten (the pre fencing) is always a free attack since you haven’t actually made contact, and thus you aren’t definitely on one side of their blade or another until the blades actually cross. Your opponent is in a guard (controlling the center), you feint a thrust and they over commit to their parry (displace your blade) so you disengage and thrust them to the other side, of course reorienting your blade to guard against a possible counter thrust. This dips into the next level, but can be interpreted purely at the level of goals, they intended to control the center, your feint tricked them into changing from controlling the center to displacing you which created the opening you needed to thrust. You can see that many of the best actions in fencing also combine several of the core goals as well, such as the disengage (free attack) to the thrust from guard (controlling the center). Often times this is why these wheels end up getting so complex in the first place. Your goal should always be to do an action that counters what they are doing at that instant, as well as defeat their likely followup actions as well. 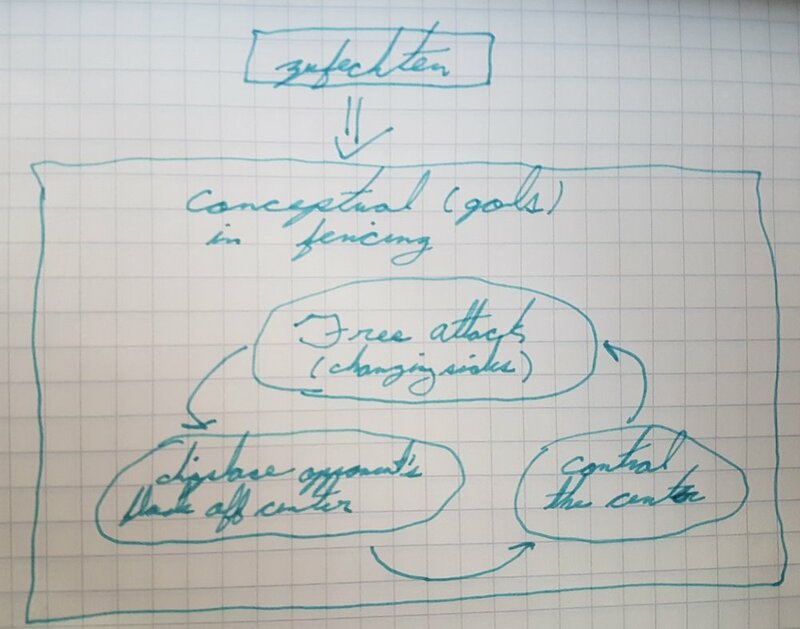 That being said I don’t think creating hybrid categories is as useful as understanding the most simplified goals and seeing how you can do more than one thing with one action, since that is really the key to developing good fencing in the first place. It is actually not uncommon for people to jump around in this wheel, but every time they choose an action that doesn’t defeat the goal of your action they leave an opening for you to exploit. And that’s really what this is useful for, understanding where openings occur so that you can exploit them. The next level of fencing comes down to the psychological portion of fencing, ie dealing with the opponent’s intent rather than their actions. Really any action where you aren’t trying to stop the opponent from cutting you before your attack lands, even if you are trying to prevent probable attacks that occur after you launch your attack. This starts to deal with timing since you would predominantly do this when you have initiative, that is any time your opponent isn’t already attacking you. A feint is any attack that is not designed to hit the opponent, but instead draw out an action for you to exploit. A feint can, and should, become a dedicated attack the instant you realize the opponent isn’t reacting. In essence it is a form of deception that causes the opponent to react and allows you to either attack them directly, or counter their action. Your opponent is in a guard (intention to counter), they have done several feints previously and you believe that they are going to disengage and thrust from the other side (feint) so you thrust directly at their head (Intention to attack) guarding against the thrust you expect from the other side, your thrust slides off to the side and your opponent thrusts you as you recover (the counter attack works). This situation seems incredibly stupid from the previous level of analysis (what to do technique wise), but it starts to make a bit more sense when we look at it in terms of psychology. In many ways the point of this is to disrupt the opponent’s intentions with deception until they can’t tell whether you will attack, counter, or feint. This is my best attempt at distilling what I have seen over the past several years of fencing and martial arts in general, and using it to help inform people to make better decisions in their fencing. Deflections are used to stop an opponent action, but they must be done properly. This is what happens anytime you stop an opponent's cut without threatening them at the same time. These are usually done as a 'parry then repost' form of fencing. The main issue with this style is the gap between the deflection and attack, creating an opening for the opponent to deflect your blade, or perform a single time counter and steal the initiative from you. Ideally a single time counter is done as an attack that intercepts the opponent's blade on your weak as you drive your own weak to their body. These are arguably the defining aspect of the German school of swordsmanship and the majority of actions in the Fechtbucher focus on this type of counter. This means that they are always done in response to an opponent's action. In other words they have acted first and taken the initiative, which you will now need to take back from them. Alternatively to using displacements you can work to take the initiative from the Zufecthen, the opening of the fight, and maintain control over it through distance, and attacking with good form. Against a bad opponent this will provoke them into using empty displacements, creating openings for you to attack, i.e. a Nachreisen, Abschneiden, Schnappen, etc. In other words if you seize the initiative, there are several options for defeating empty displacements. Competition is fun and exciting, but you have to have the right mentality for it to be useful. When new students get a chance to do freeplay they are often surprised to find it isn't what they expected. The nice clean techniques we drill in class suddenly disappear into wild thrashing just to fend off the opponent, and no matter what they do they can't seem to hit the other guy. This is normal. As soon as you get even a moderate amount of stress in a fight most people break down back to instinctual fighting, which is easy for a calm opponent to pick apart. The stress is usually amplified by the fact that no matter what you do your opponent seems to hit you constantly but you can't land anything on them. Instead of trying to win, use freeplay as a test to figure out where you need to improve. In this day and age we aren't about to fight a duel to the death with swords, so losing doesn't mean death. Calm down and pay attention to what you opponent is doing, look for the openings you recognize and stick to a basic game plan. A good place to start is the plays. Pick one and try to stick to it. Intentionally confine yourself to a small set of actions until you learn it inside and out. You need to master those moves until you can instantly judge range, timing and what your opponent is likely to do without thinking. And when you notice you mess something up regularly, go back and drill it until you get it right. There's no shame in going back to the basics to fix a problem. Then work on incorporating that action into freeplay again, and keep fighting until you find the next problem. The point of freeplay isn't who wins, it's about testing yourself and improving. If you just focus on making your art better, eventually you will end up winning as your skill improves, but let it happen naturally. Freeplay is a valuable tool if used properly, but otherwise is a waste of time that will degrade your technique and frustrate you. Information gathering is crucial in every form of competition, from distance running and chess to business and martial art. Ignoring your opponent is in fact the height of arrogance and stupidity, and demonstrates a poor attitude towards your practice and sportsmanship in general. Some argue that it's a shady practice, however those people are wrong. If simply knowing what an opponent can do gives you an unfair advantage, then they are relying on gimmick, and after a short period of time this will show. Studying their style however shows a respect for both their practice, and their ability leading to better competition on both sides. It is your ethical duty in a competitive setting to find the flaws in your opponents game and attack them until they are forced to improve. This demonstrates skill on your end, and forces them to elevate their own practice. When two parties interact, they both have equal opportunity to learn and improve from their experience. It is your responsibility to adapt based on these exchanges and leads towards better art overall. If you share what you have gathered from these with your peers, then again, it only serves to elevate your art, and you can be certain that if your opponent is competent then they will certainly be sharing their experience with their group. The other side of the argument is to say that you shouldn't adapt to your opponent, essentially learning nothing and changing nothing from any experience. This is ridiculous, especially because we as humans are incapable of doing this since it occurs on a subconscious level. It also follows that you must keep silent about anything that you have encountered, and allow others to continuously repeat the same set of mistakes without warning or preparation. If your are a coach or instructor this is doubly unethical, considering that this is your explicit duty. We live in an age where the idea of 'secret tactics' are becoming laughably outdated, and relying purely on something novel can't cut it for more than a couple months. If the new tactic is sound, then it will continue working beyond that. Otherwise it will spread across the internet, and people will be able to watch videos or talk about it, and form counter measures to defeat it. This is the natural way that competition and conflict weed out ineffective methods. This is why every coach who is even half competent watches videos of their opponents before hand. It isn't underhanded, it is in fact the only sensible and respectable approach to competition, demonstrating dedication and respect for the spirit of your art and sportsmanship alike. Why should we bother to study the art of swordsmanship today? In short, because it teaches lessons that are becoming more and more rare in modern society. There is an ethical aspect to martial training that naturally arises when learning any combat art, and they help to make better, more civilized people. It helps to look at a warrior's role in society. On the most basic level, we all need to feel safe to pursue our goals in life. Without people dedicated to helping create this situation society breaks down as everyone works to secure their own survival by any means. In a group where there are no protective warriors, the strongest and most ruthless take whatever they want, and nobody can stop them. To prevent this collapse, we need people who have the skill, and the motivation to stop these tyrants from taking over. Thus we have organizations such as the military and police who were created to protect us from external and internal threats. This however can lead to a situation where only those groups learn how to deal with intense situations, and unfortunately, they aren't able to be everywhere at once. Not to mention that I find government institutions to be inefficient at best, and self serving at worst. Relying entirely on others to keep you safe is like telling kids that the only way to deal with a schoolyard bully is to tell the teacher. If the teacher is around, maybe the bully acts in a civilized way, but as soon as they aren't around the bullying will often get worse. Studying martial arts in general represents an alternative approach. Instead of relying on someone else to protect you, it teaches you the skills and confidence to protect yourself. When you are able to stand up to a bully, or a tyrant they are forced to behave. When you are able to actually defend yourself, and you have been taught proper ethics, you become a civilizing force. Bullies and tyrants look for those who are weaker than them, who won't stand up or fight back. Just by standing up for yourself you greatly mitigate the need for actual violence, since they often will look to find an easier target. If they do resort to violence, then they were going to at some point anyway, and having the proper skill to stop the immediate threat to your own safety, and the safety of others becomes critical. When you know what the appropriate amount of force is, you can use less and keep more people safe. As you train, you begin to realize that you may get respect for your ability. Without proper teaching, this can create terrible people, which is why an ethical code naturally arises alongside any respectable martial school. The student must be taught that when they see violence happening, that they must work take action to protect those around them, or they become nothing more than a thug. The reason why learning swordsmanship is timeless is because it teaches the courage, discipline and mentality needed to ensure the safety of the people around them. This is the basis for civilization and freedom. If every person was capable and willing to help others in need it would benefit society as a whole. The reason I teach this art is because I believe in building strong people, and strong communities who care about each other. This just happens to be my way of doing that. We never have enough information to fully understand our situations, and often we have to make good decisions under these circumstances. Here is an approach to making the best decision you can even when you don't have much to go on. First we have to recognize that we make up models that simplify our experiences, taking in only what we have learned to be the most important information. Because we are using these simplified models we need to measure them by their effectiveness in the situation rather than their absolute accuracy to reality. If you believe your house is on fire, it is likely you will try to escape, but in some instances smoke doesn't mean your house is on fire. To make your models better, it is important to start out with the most direct path towards your goal. If you believe your house is on fire, the best course of action is to evacuate it quickly. As you gain more experience, you will begin to recognize more important information and formulate patterns. As this occurs your model will begin to become more complex. You shouldn't try to skip steps and rush this though, instead focus on getting the best information you can and then act on that. After realizing that your house isn't on fire multiple times, you'll remember that you just left the stove on, and that you should turn it off before a real fire starts. The important thing is that you don't confuse your models with reality itself, and that you treat them as flexible. Since the model doesn't need to conform perfectly to reality, you can change it to help you make useful choices faster and more quickly. This is extremely applicable to martial arts training as well. I recently had a conversation with Gavin Cornelius, founder of the Young Entrepreneurs Society (international is in there too at the end) and we ended up discussing context at length, and just how important it truly is. Gavin is a fan of the Myers Briggs personality test, and so are many business people. It seems great, it was developed based on psychology, measures multiple dimensions of personality and I find it almost completely useless. Here's the problem, it ignores context. So let's examine why that could possibly matter when it comes to personality types, since surely we are who we are no matter what right? Actually no. The Stanford Prison Experiment is possibly the most well known example of this, essentially concluding that the behaviors of an individual have more to do with their situation than their personal characteristics. This is also the same with the Milgram Experiment. The important thing to get is that what we would normally think of as a self contained identity, the behaviors and concepts of 'who we are' are in a constant state of flux depending on our situation. In other words, our personalities are a emergent manifestation of our context, the way that lighting is simply the discharge of electricity, a wave is a movement in a medium, and wind is the equalization of pressure in the air. Looking at it another way, our context is inseparable from us, we are it and it is us, the way that there is no wind without air, the two are interconnected. This is really important for mastery of self and mastery of others. Sure each individual has different dispositions, which is to say they require different specific situations to register differently on the 'dimensions of personality' but there is almost always some conceivable way for someone to get seemingly contradictory traits to manifest in the same individual. I can use myself as an example. In many circumstances people find me to be introverted, even to the point of anti social hostility, and others know me as an outgoing assertive person. The main factor is to whom I am talking. I find some people fun to talk to, and conversation flows easily, others I can hardly relate to at all, and as such I feel no need to try and force a conversation. If you are running an organization it is key to understand and use this to your advantage. Find out the dispositions of your team, and place them in such a way as to encourage the characteristics you deem most desirable. Learn to feel the context as an extension of yourself and those around you. Feel it extending invisibly around you and learn to move it, alter it to the most useful configuration until what you want comes about of it's own volition, like a sailboat being pulled by the wind. This goes the same for yourself as well. If circumstance dictates our persona and behavior then the only thing left is to master circumstance.